The world of music has lost another great one. 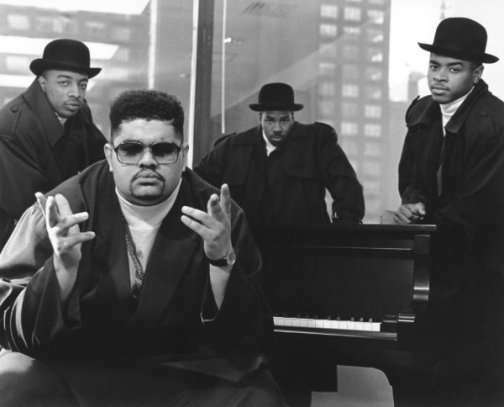 Dwight Arrington Myers, better known as Heavy D, died Tuesday at the age of 44. The Jamaican born rapper and music producer was taken to Cedars-Sinai Medical Center in response to a 911 call that was made at 11:25am after someone found him unconscious in the front walkway of his Beverly Hills home. Although conscious and able to speak when help arrived, Heavy D was pronounced dead in the emergency room at 1:00pm. According to initial reports, pneumonia may have played a part. Police are investigating the circumstances of the death and indicate there are no suspicions of foul play. According to TMZ, Heavy D was 6’4” and weighed 344 pounds at the time of his death, but had made strides in recent months to change that and improve his overall health. One of his most recent trainers — a guy named Tony, who helped Heavy D lose 150 pounds in 2008 — tells TMZ, D stopped in to Ultra Body Fitness in West Hollywood 3 months before his death … and began to re-strategize his training program. Tony tells us, the rapper looked like he hadn’t worked out in a while and wanted to get active again. At that point, sources close to Heavy D tell us, the rapper embarked on a daily running regimen and frequented several other nearby gyms to diversify his exercise experience — incorporating everything from hiking to boxing. At his peak, Tony tells us, Heavy worked out 6-7 days a week. Call me crazy, but I’m guessing the coroner will rule Heavy D’s cause of death as heart failure. You can’t go from nothing to daily workouts and not expect some sort of physical reaction like the heart not being able to handle the sudden surge in activity. Just sayin’. 53 queries in 1.664 seconds.